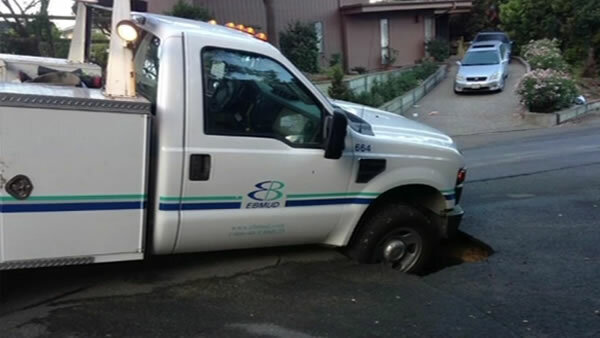 BERKELEY, Calif. (KGO) -- An East Bay MUD utility crew found themselves stuck in a sinkhole they were sent to fix on Friday. Jennifer Lombardi captured the incident in her Berkeley Hills neighborhood. She called the district to report a river of gushing water that was carrying away chunks of the pavement and when crews arrived, they found out firsthand how serious the situation was. "I came out here and there was the truck with one wheel down. I mean, I came out several times," Lombardi said. Water officials say a cast iron water main built in 1931 caused the sinkhole. The main has been replaced and the sinkhole has been filled.